A fashionable way to play with modular knitting! One strand of Victorian Boucle and one strand of Victorian 2-Ply held together creates a soft, solid but lofty fabric reminiscent of felted boucle outerwear. This unique vest is constructed all in one piece, with incorporated i-cord edges and minimal seaming. One size fits most. 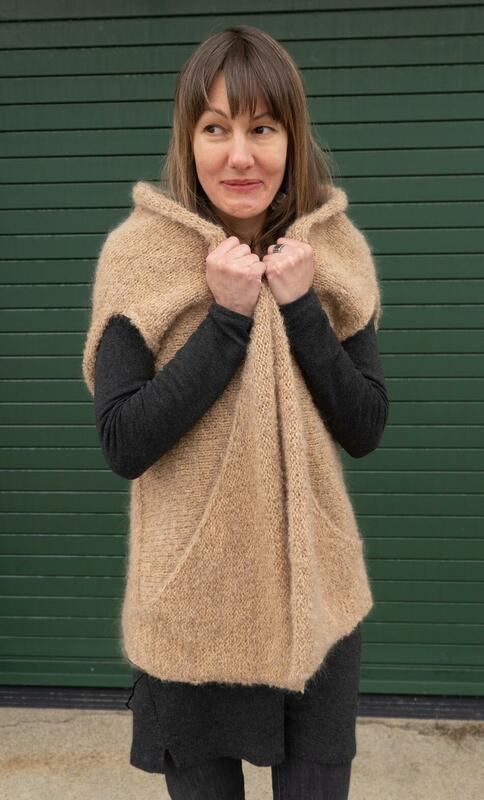 The easy shape of this vest allows it to be be worn many different ways, on many different body types. Finished bust, held closed: 44"
This pattern is free when you purchase the suggested yarn(s) below! Please remember to add it to your cart if you would like us to include it in your order. print version: this pattern is also available as a pdf download.